There will be no Sea Cavalcade in 2019. 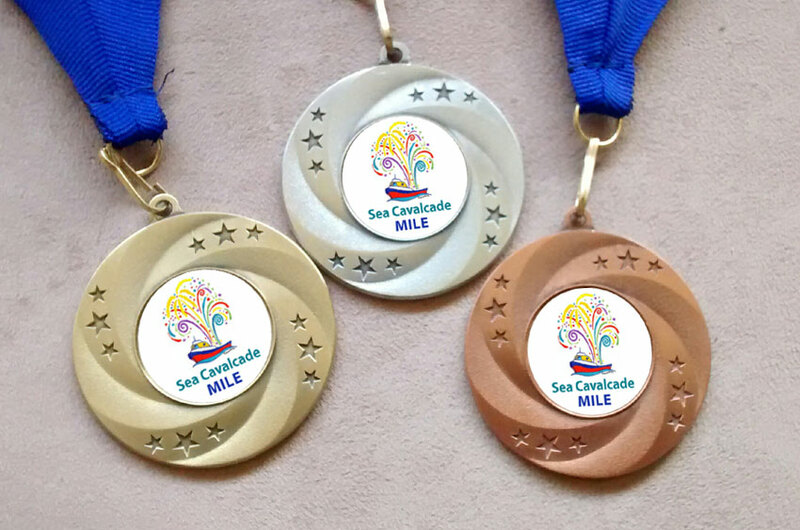 We are looking into alternative venues and dates to hold a mile race anyway. Stay tuned. Grand Draw Prize: gift certificate for a pair of Brooks shoes from PaceSetter Athletic! Grand Draw Prize: free pair of shoes! Thanks to generous sponsorship by Brooks and PaceSetter Athletic, one of our participants will walk (or run) away with a gift voucher for a pair of running shoes! Compete in both the Sea Cav Mile AND the Keats to Armours Mile Swim and you'll automatically be entered in the Surf & Turf Mile Challenge! Those with the lowest combined times* will be the winners: 1st Open Male & Female and 1st Youth (17&Under). Each will win a prize! This is a foot race only. No dogs, other animals or wheeled items allowed in the event, with the exception of running strollers/baby joggers (must start at the back). Do not register babies or children who will be riding in a running stroller. Only those moving on their own two feet will be assigned bib numbers and included in results. Saturday July 28 (race day), 9:30-10:15am at PaceSetter Athletic. Cheque, cash, debit or credit accepted. Don't leave it until the last minute! Come early, then do your warm-up. 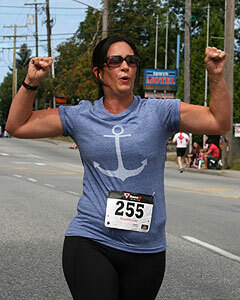 Saturday July 28, 10:30-10:45am at the start line (100m east of Park Rd on Gibsons Way). Arrive with your entry form already filled out! Cash or cheque only. Registration CLOSES at 10:45am sharp — absolutely no exceptions! We can't be late starting as the parade is right afterwards. NEW COURSE SINCE 2016. Start line is on Gibsons Way 100m east of Park Road, in front of the RE/MAX office. See map with elevation profile. Course features: wide closed highway, net downhill, single turn only. Slight incline (8m elevation gain) over the first 400m; the rest is gradual downhill or flat. Last 250m are downhill for a blazing finish! For the last half of the race you'll be on the parade route with hundreds of spectators cheering you on! Accurately measured with a Jones Counter. Every 400m clearly marked. Wear your bib on your CHEST where it is clearly visible. Not on your leg. STAY IN THE CHUTE IN ORDER OF FINISH after crossing the line, until your bib # has been recorded by one of us with a clipboard. Keep walking as directed. Refreshments at the finish line: watermelon, water, and homemade baked goods! TIME BONUS: $50 bonus for first male to break 4:00, first female to break 4:30. Draw Prizes — you have to be at the ceremony to win! Grand draw prize: gift voucher for a pair of shoes from PaceSetter Athletic! Sea Cavalcade Parade follows immediately after race, plus a full weekend of fabulous festivities (see Events Schedule). Any net proceeds will be donated to the Sea Cavalcade to help put on this fabulous weekend festival. Take the Langdale ferry from Horseshoe Bay in West Vancouver — see www.bcferries.com for schedule and fares. Fare is round-trip. Debit card, credit card and BCF Experience Card accepted at self-serve passenger ticket booth; cash, credit card or BCF Experience Card at regular vehicle and passenger booths. ATM on ferry. The ferry ride is very scenic with views of Gambier Island and the coastal mountains. The ship is a large "C class" vessel with a full service cafeteria, gift shop, snack bar and room for about 1500 passengers and crew, and more than 360 vehicles. Driving directions (see map — click to enlarge). Coming from Langdale/ferry: follow the Sunshine Coast Highway up the big hill, left at the top (becomes Stewart), right onto North Road (main traffic route). At the next light turn right onto Reed Rd, then left on Payne to the light, right onto the highway (at IGA), left onto Hough Rd, left into parking lot at PaceSetter. Public transit also goes from the ferry. From Sechelt etc. : as you are coming into Gibsons, turn right onto Hough Road (just past Veterans) then left into parking lot at PaceSetter. July 27: Read David's Sea Cavalcade blog entry: "The Beauty of British Columbia Doesn't Disappoint"
David O'Meara, creator of www.OneMileRunner.com, is traveling throughout the United States and Canada this summer to accomplish a feat he calls 20/20/20<5@45. That's completing 20 one mile races, in 20 weeks, in 20 different North American cities, in less than 5 minutes each — at 45 years old. 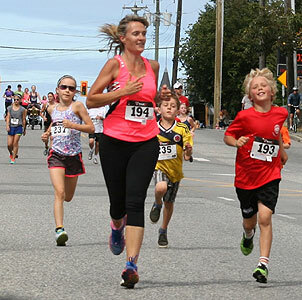 With races as far reaching as Florida, British Columbia, New York, Alaska, and Hawaii, O'Meara's mission is to inspire older athletes to run faster. O'Meara is using Web 2.0 technology while he travels to journal, blog, and podcast about his experiences, insights and newfound friends. He welcomes visitors to pose questions to him or his personal team of experts. Addressing the topics that affect every aspiring athlete over thirty, this team of experts will help older runners understand the importance of proper biomechanics, training, nutrition, and recovery. O'Meara, an inspirational speaker and coach, was ranked 9th in the US in 2007 for the one mile 40-44 age group with a time of 4:37 (13mph) and a personal best in 2006 at 4:24. O'Meara is sharing his training methods, performance techniques and improvement processes with running clubs and local organizations in each of the cities he visits. His inaugural race was May 10th in Tarpon Springs, FL. 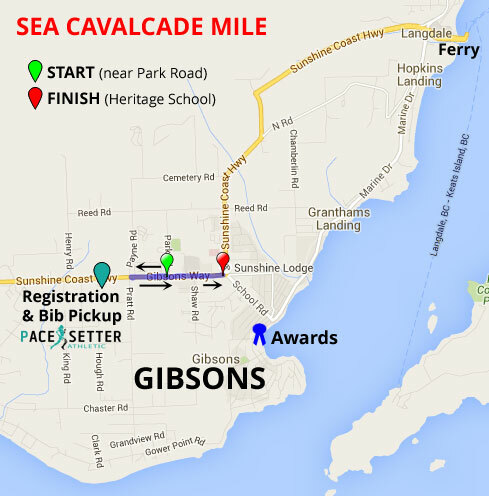 The only Canadian race currently scheduled on his tour is the 6th annual Sea Cavalcade Mile on Saturday, July 26th in Gibsons, BC, hosted by Sunshine Coast Athletics, and part of the 3-day Sea Cavalcade Festival. All local runners, especially 40+ masters members, are invited to join O'Meara as he goes for his 13th sub-5:00 mile in 13 weeks. For a complete list of O'Meara's open practices, races and speaking engagements, please visit www.OneMileRunner.com.